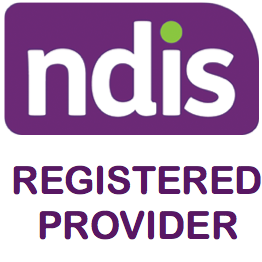 At 21 years of age, Izaac is not letting disability stop him from following his dreams. Through experiences with the RDA and a cutting clinic, Izaac realised his love of horses and his passion for the sport of horse cutting. He now has his sights set on competing in cutting competitions and has also begun the journey of setting up his own not-for-profit organisation aimed at helping others. 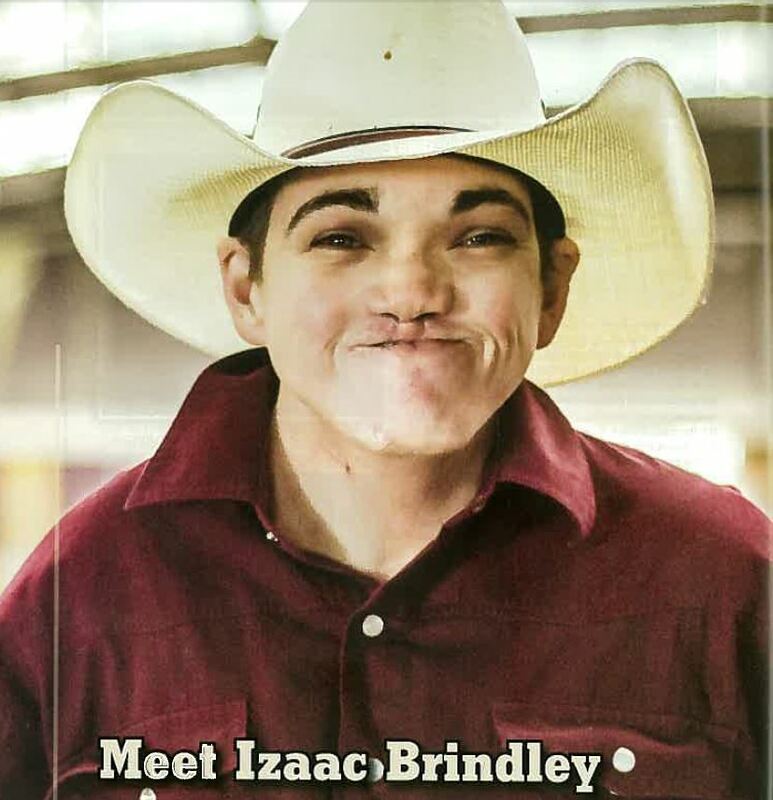 The Izaac Brindley Association will run activities and programs for people at risk to develop life skills in a supportive, caring environment, based on horses and farm activities. 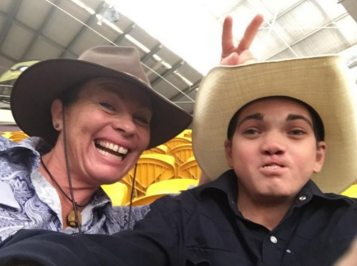 Recently, Izaac attended the Legacy of Legends event in Tamworth (NSW) from January 1 to January 10, 2016. Not only did he learn by watching the horse training clinics as a Fence Sitter; he met an array of like-minded friends from many walks of life. Although not around anymore, their legacy is carried on through clinics with Buck Brannaman, Carolyn Hunt (Ray’s widow, pictured with Izaac) and Jaton Lord (Ray’s grandson, pictured with Izaac below). Izaac interacted with these legends, shared a drink or two, mingled, and met many new friends. Being able to attend this learning opportunity was a long-planned and worthwhile event. Izaac booked months in advance, and it was the focal point of his attention. He couldn’t wait for Christmas to come and go, waiting for the New Year, when his journey to the event in Tamworth began. Without generous assistance through grants and funding, this trip would not have been achievable for Izaac. When we drove the eight hours to Tamworth, Izaac barely looked at the scenery, as he was eagerly counting down the kilometres. Apart from the actual event, Izaac learned from the planning and coordinating of such a trip. He had animals at home to organise and ensure they were looked after, as well as the planning of the driving, entries and accommodation. Once there, Izaac was immediately and warmly welcomed by Deb Desreaux of Reata Ranch, who were the event hosts. 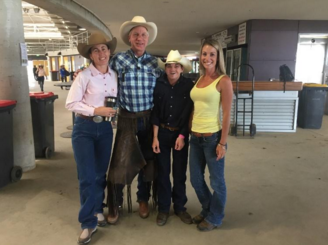 Izaac met the legendary Buck Brannaman, Carolyn Hunt and Jaton Lord. Jaton is a young man from America who always stopped to ‘chat’ to and acknowledge Izaac. Another one of many new friends is Dr Susy (pictured with Izaac below), who is a GP near Perth. She was an amazing example of a true Aussie, she drove herself and her horse across from WA to attend this event, and became a life-long, firm friend. 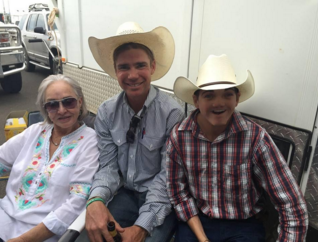 Dr Susy, along with others, would sit with Izaac, watching the Legacy of Legends clinics for hours on end, chatting about their common interest – horses. Izaac had many social meals and drinks with his new friends while learning about the training methods of horses. The social awareness and confidence Izaac gained, all within a safe and caring environment, was in itself amazing. Izaac gained many friends, independence, and now has his sights set on Texas. I’m sure he will get there one day. Many thanks to Deaf Children Australia for assisting Izaac in meeting his expenses for getting to, and attending, this Legacy of Legends event in Tamworth 2016. Izaac is now settling back into life at home with his horse Phantom. He will be attending Riding for Disabled Pony Club, and many other local horse events with encouragement from his many talented support workers. He has also started organising meetings and paperwork for the Izaac Brindley Association. For more information on the Izaac Brindley Association head to www.learntorideridetolearn.com.